If you keep the Applications folder in the OS X Dock for quick app launching you’ve probably noticed it’s just a giant list of all the apps installed. Sure you can change the display to use a grid, list, or fan, but if you have a lot of apps you’ll still end up with a humungous unsorted launcher with a lot of apps you probably don’t want in there. Here’s an easy way to get around those limitations and annoyances by creating a separate app launcher for the Dock that is sorted by defined categories, featuring only the applications you want. This is perfect for anyone with large amounts of apps installed who likes to keep things organized. You may want to remove the “alias” reference from each app name, or rename them as you see fit in general. Additionally you can complete the overhaul by copying the primary Applications folder icon to the sorted folder of aliases, this gives the appearance of it being the normal Application directory. If you keep the Dock hidden by default don’t forget to remove the hide and show delays for much quicker Dock access too, it makes menus like these even more useful by rapidly speeding up their accessibility. Thanks for sending in the great tip Jay! If you want it back, drag it! This is nice for Snow Leopard pros who hate iOS sorting and prefer categorization. And please, if you want to help me out and get more tips, visit tehninjah.tumblr.com! Customized, folder based, heirarchical Application menus were the norm with OS X pre-Lion :P Just change to grid (fan doesn’t work nice)! yes, way to go, turn osx to windoze! I prefer Spotlight to launch an app or anything on my MAC. Just hit cmd+space and type in the first few letters of the app and you’re done ! i am not interested in even going to the folder. cmd+space bar. first there letters of the app. forget about it. i never want my mac to look like windows. that would be dumb. spotlight is king and visuals are everything. Wow. Who cares if this feature resembles something in Windows. You guys really care THAT much? Are you too good for anything that resembles Windows? I use OSX and enjoy it a lot but I’m not going to ever be a snob about it. If Windows has a setting or a feature that would be useful to have in OSX in it too than by all means. 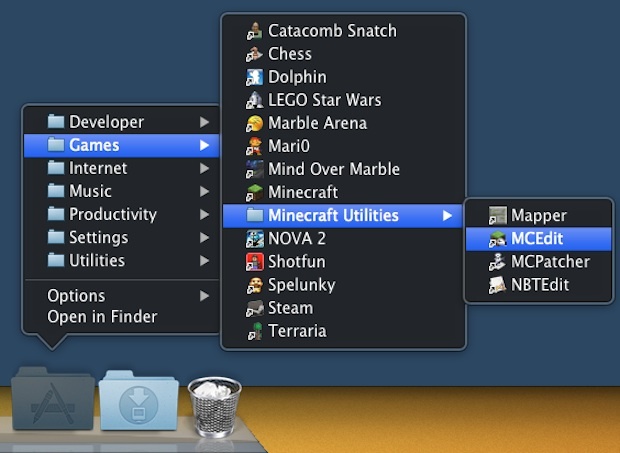 In fact, I could think of a lot of things I do miss from Windows that I wish were in OSX. I did this a while ago, but instead of having one folder like Windows, I made a folder for each of the main apps i use. For example: web, design (adobe and skitch), media (spotify, vlc), general (parallels, transmission). looks pretty sweet with custom icons. I’m fascinated how Mac people truly deeply care about not looking like Windows. This religious component keeps amazing me. Computer is a tool to do the work, guys, it’s not a way to show the girls how “different” you are. If you’re unsure your identity, there are better ways to resolve that than getting a Mac and “being different”. Do you realize how SAME you are to all other Mac users? I see nothing “different” in that. Mac users are 10x more “same” than Windows users, because you can customize your copy of Windows much more, and be much more “different”. You’re funny, boys. SIDENOTE: I don’t care as long as the OS does the job. Currently I’m on a Mac because I got it half the price and it’s a strong machine. Next one? Whatever serves the purpose.